Marine Insurance: Law and Practice, Second Edition, continues to provide the most comprehensive and integrated account of the English law and practice of marine insurance. 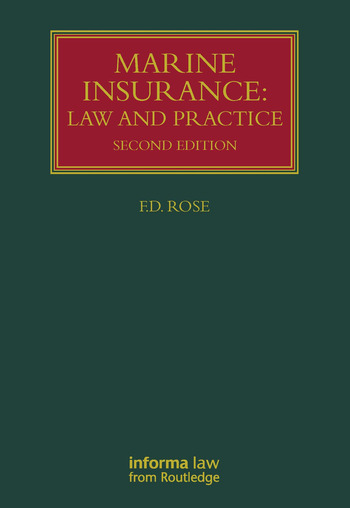 It provides readers with a fresh and up-to-date review of the modern law in the light of traditional principles and rules of underlying commercial law, and the specific statutory rules of marine insurance as interpreted by case law, as moderated in practice by market practices and standard form marine insurance clauses. Francis Rose clarifies the law’s underlying framework of principles and illustrates how it works in common contractual situations, explaining how the different components of the law interact. Francis Rose is a graduate of the University of Oxford, holds a PhD from the University of London, and is a barrister and associate of chambers at Quadrant Chambers. He joined University of Bristol Law School in January 2000, having previously been Professor of Commercial and Common Law at the University of Buckingham, and before that, a Fellow of St John's College, Cambridge. He was the Director of the Norton Rose Centre of Commercial Law within the Bristol Law Faculty from 2000-2005. He was the inaugural Sections Secretary of the Society of Public Teachers of Law and is Convener of the Society of Legal Scholars Restitution Section. "…this text (is) one that all in the field will find themselves constantly consulting in the years to come." “This textbook is a welcome addition to the texts on marine insurance law as it combines in one volume all the areas which a practitioner or student of marine insurance law needs to know. It is written in a very readable style, which makes it readily approachable for those unfamiliar with this topic. It combines an academic's insight into the law with a modern and practical approach to problems that frequently beset marine insurance. This book richly deserves to be the winner of the annual BILA book prize."